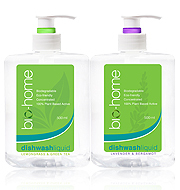 bio-home dishwash liquid uses biodegradable, renewable plant-based active ingredients in a concentrated, easy rinse, low foam formula that reduces water usage. pH balanced and dermatologically tested, bio-home dishwash liquid is tough on grease but gentle on your hands – and the environment. Caring for your home. Caring for our environment.